This is a very tasty yummy dish which you can eat as a side dish or main dish with rice or roti. This dish took less than 30 min to cook . 1. Wash the Bhindis and dry them with kitchen towel. 2. Cut the top and tail of the bhindi (Okra). 3. Make a horizontal cut(length wise) cut in bhindi (don't cut in 2 halves, just make a cut in center). 4. Now heat the oil in a pan and fry bhindis in it for 5-6 min on medium flame. 5. Now add all the above mentioned dry ingredients and mix them well. 6. Cover the pan and let it cook for other 5-7 mins on the medium flame. 7.Turn the bhindis very gently and cook again for 2-3 minutes. 9.Your Masaa bhindi is ready to eat . 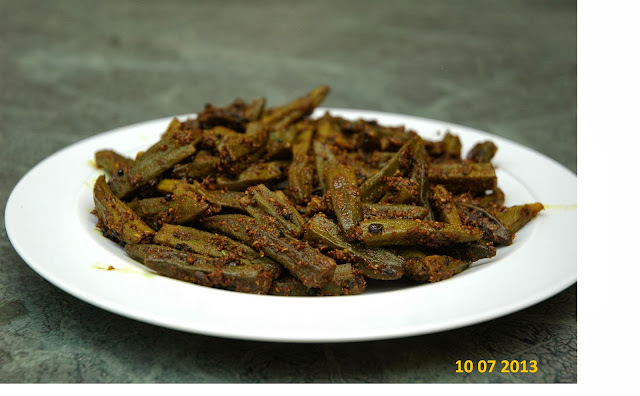 *This Bhindi is Recipe is very easy to cook and delicious in taste. If you want you can cook the masala separately first then stuff the masala in the bhindis and cook them in the same manner mentioned above. * The another way to cook this recipe is you can make them in the same manner you cook "Stuffed masala baigan". That is mix all the dry ingredients in a palte .Then stuff the dry masala in each bhindi and fry them in the same manner .